If you're like me, you're preparing to host guests during the upcoming holidays. And you'd truly like to be a gracious host. This year will mark the 30th Thanksgiving and Christmas my husband and I have celebrated in our own home. "Home" for us has ranged from a 500-square-foot apartment in married students' housing to our current large house. Over the years I've learned that the welcome I provide my guests is much more important than the fanciness of the space. The goal of hospitality is not to pamper our guests; it's to make them feel welcome. So don't be intimidated by the idea of trying to create a guest space that's comparable to a four-star hotel. Instead, try to anticipate your guests' needs and try to make them feel at home. 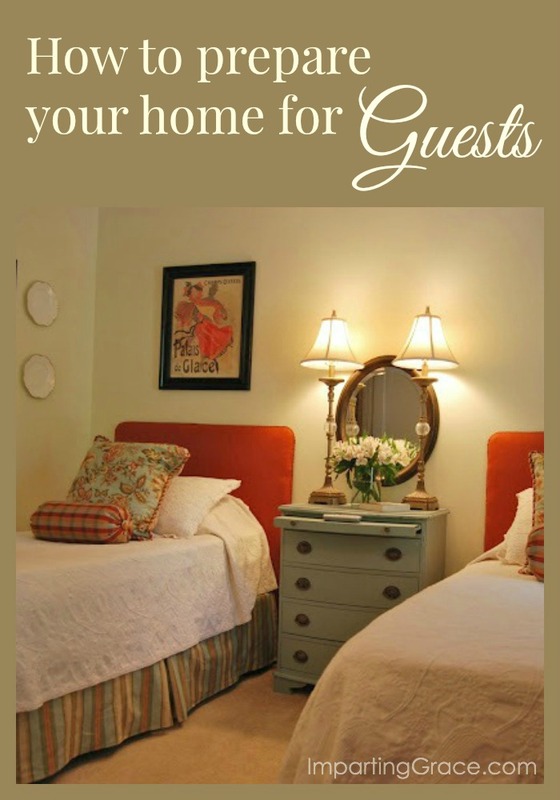 Here are some simple tips for preparing your home for guests. Make sure the bed(s) are comfortable. The best way to do this is to spend a night in the guest bed! I did this and learned that my guest beds weren't quite supportive enough. I remedied that situation by placing a sheet of plywood underneath each mattress, then added a foam topper to each bed. I like twin beds in a guest room, which makes the space more versatile. I've found that most married couples don't mind sleeping in twin beds for a night or two, and this way the space can easily accommodate others. Be sure that your bed linens are nice and clean. Since some guests suffer from allergies, don't use heavily-scented detergents or fabric softeners when laundering linens. Instead, add some white vinegar to the rinse water. Don't forget to launder or dry clean blankets, bedspreads, comforters, and pillows as needed. 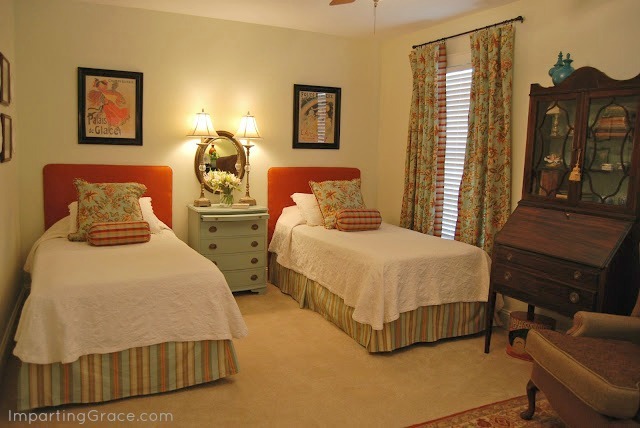 If space allows, keep extra sheets, blankets, and pillows in the guest room. Mine are on the top shelf of the closet. 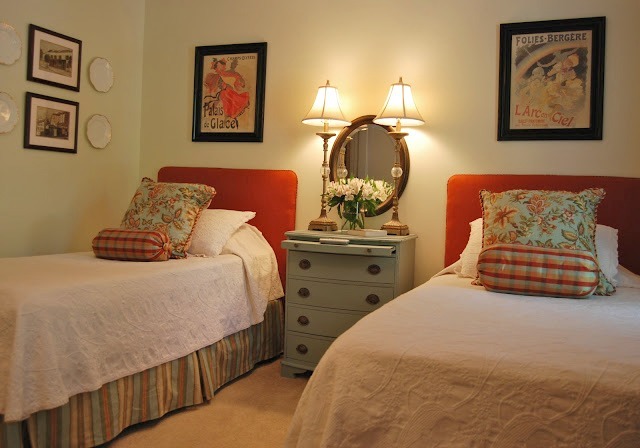 While the linens are off the bed, take the opportunity to dust and vacuum the guest room thoroughly. Take a good look at the carpet or rug while you're vacuuming to see if steam cleaning is needed. If your guest bed needs a headboard, you can easily and inexpensively make an upholstered one! All you need is a piece of plywood, some foam, fabric, and a staple gun. Click here for a simple tutorial. And if you're in need of a night stand, consider any piece of furniture you might be able to re-invent. 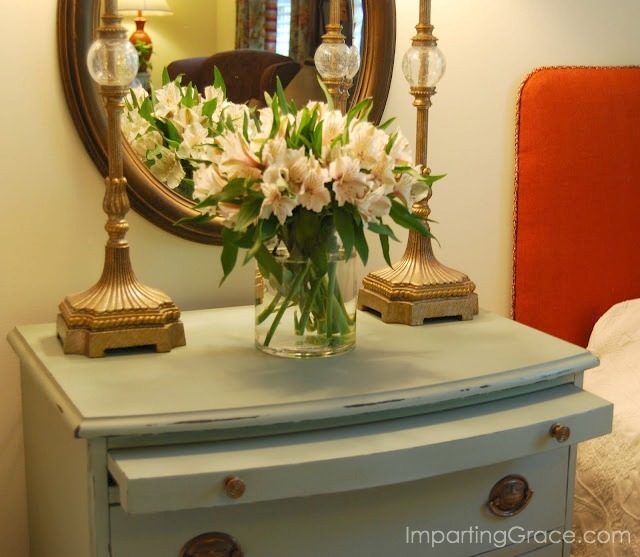 The nightstand in this room was a small chest from Bombay--remember that store? I painted it with homemade chalk paint, and now it has a new life! Supply the guest room with a spot for guests to place their luggage and room to unpack their clothes. Guest closets often provide necessary storage space in homes, but be sure there is ample space for guests to hang clothes. Provide plenty of nice hangers and an ironing board and iron if possible. 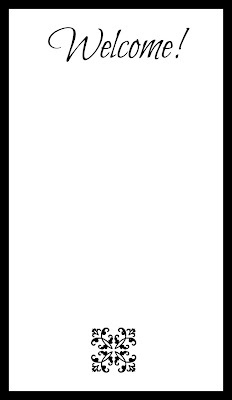 Provide several sources of light, including a lamp by the bed. You may also want to provide a night light which guests can unplug if it's not needed. Now for the guest bathroom. If you're very fortunate, you have a bathroom attached to the guests' sleeping space. If not, be sure that your guests know which bathroom to use and be certain that the path to the bathroom isn't blocked in any way. If the bathroom is down the hall, you may want to place a night light in the hallway. Scrub the bathroom thoroughly. If needed, wash the rugs. Check the shower curtain liner and wash or replace if necessary. Double-check the sink and bathtub/shower drains. If they're running slow, use a drain opener to get them cleaned out. Alternatively, pour some full-strength bleach down the drains, followed by the hottest water your tap will produce. Or to clean your drains more gently, pour some baking soda followed by white vinegar into the drains, then flush with hot water. 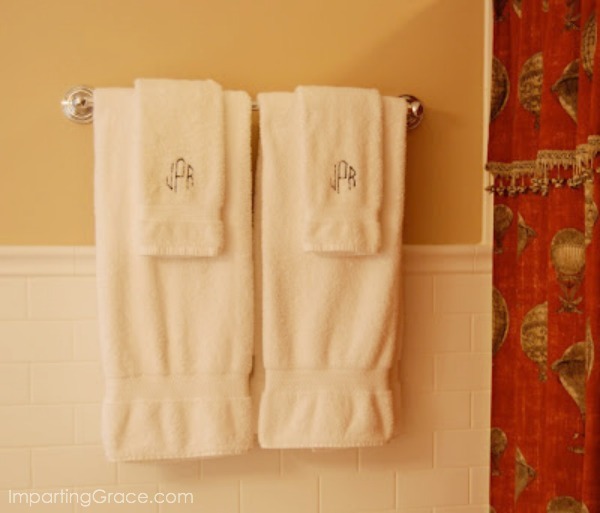 Stock the bathroom with plenty of fluffy towels and washcloths. Towels needn't be expensive, just thick and thirsty. 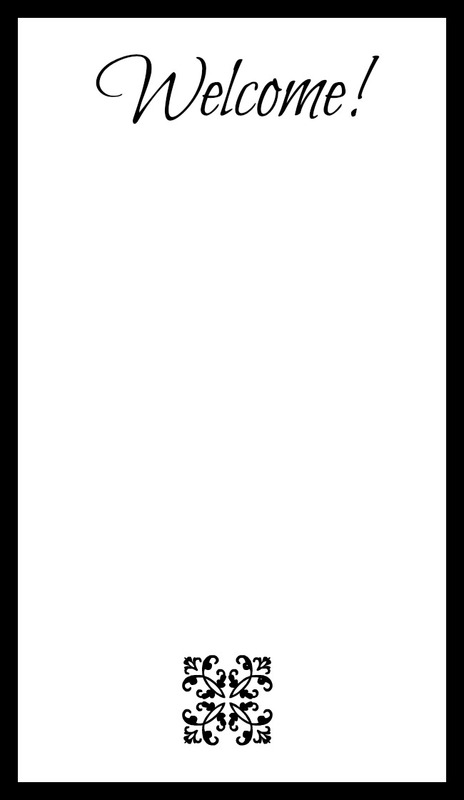 Taking a cue from luxury hotels, I prefer white towels, which are easy to keep clean and stain-free and work well with any decor. (My local Sam's Club has wonderful fluffy towels for just a few dollars each.) Be sure to provide lots of wash cloths, which you can buy inexpensively in bulk packages. If you don't have a bathroom attached to your guests' bedroom, simply place a stack of neatly folded towels and washcloths in their sleeping space. don't they look pretty hanging with the fluffy white guest towels? Be sure there's plenty of toilet paper close at hand. Also, consider keeping a plunger and a package of disinfecting wipes in the guest bathroom. Many houses now have water-saving toilets, which can easily be clogged; most guests would prefer to remedy that situation quickly and without having to bother the host. In the same vein, keep a package of light bulbs handy. Provide at least one mirror outside the bathroom. A full-length mirror is ideal. Be sure the mirror is close to an electrical outlet. You might also want to include a key to your house so that guests can come and go as they please. However grand or simple your space, your guests are sure to appreciate your hospitality if it's offered with grace and love. Click here if you'd like a full tour of my guest room. Now tell me, how do you prepare your home for guests? Do you have any other tips to share? Richella that room is so beautiful and welcoming and anyone would be honored to be a guest in your home! I love all of your tips and totally agree that twin beds are the way to go. It's such a gorgeous space! We never had a separate guest room until we moved to our present house 4 years ago. It has been a pleasure to host friends for a night or a week. We have twin beds, a private bath with a half bath close by so two can be preparing at the same time. My only other suggestion to your lovely basket is a recharge cord for a phone, if you have a spare one. We have had guests who forgot their cord and it comes in handy to charge over night. Thanks for all of the lovely tips. What a beautiful and welcoming guest room! !...I love the idea of the twin beds as you stated, so versatile...I have lots of guests all year round...I have a welcome basket which is more of a gift of local fineries such as local toffee and local wine, etc....I try to include all the toiletries that they will need that is located in their private bathroom...and fresh flowers for them to enjoy...An iron and ironing board are located in the guest room closet for their convenience...Thanks for sharing your tips...have a wonderful holiday with your family!! Great tips and some I have not thought of. I always love seeing this room and wish we had twin beds, but are using queens we already had. What a beautiful room. It is magazine worthy. I'm sure that your guests felt right at home. I should wouldn't mind visiting. Such a pretty space. great reminders, and a most beautiful guest room! Hello, I think the basket idea is so nice, I am going to make one up for our guest coming. Also the reading material is always a good idea! The code for Wifi is a super great idea! I haven't had overnight guests in 6 years. Everyone lives here that I know. I'll have family visiting after I move later this year though... although they'll probably stay in a hotel because we don't have a spare bed. What a well written, thorough post! I think you covered everything! Great tips Richella! You definitely covered some things I hadn't thought about. Pinning to my Guest Room board. Such great ideas! I need to restock my supplies in the "just in case you forgot". It's amazing how many toothbrushes we hand out. I love the idea of providing the wifi password too because that's always a question. House guests arriving on Saturday, so thank you for your tips. 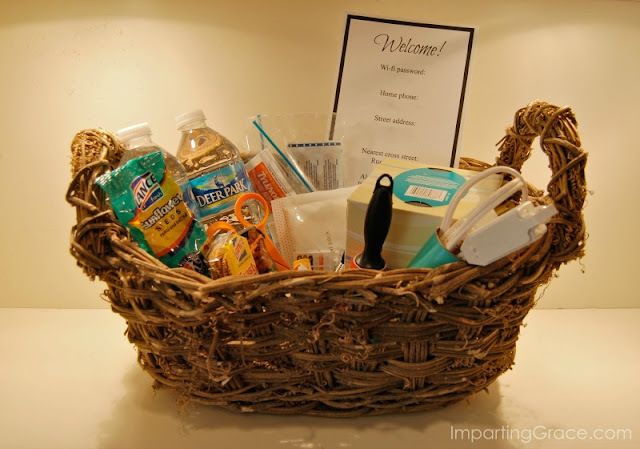 I always include a welcome basket, but you've suggested some things I've never considered. Thanks! This is a really love guide. The welcome basket is really nice. Richella, your guest room is awesome! I also like the basket you put together to make your guests feel comfortable. Love this post! Linda H.
Hi Richella! What a wonderful post! I love all your ideas. I wish we had a guest room...when you have 6 kids, your home tends to be filled to the brim. :o) Thanks for all your ideas of how to make our homes a place of Grace.